When tag draw deadlines drew near I dumped my 6 bear points on a unit that didn’t take near that many but that I knew held a ton of bears. That is a pretty safe bet in Colorado because this state had the genius idea to put wildlife management decisions in the of a public vote which led to Colorado not allowing baiting, use of dogs or a spring season…This does three things. One pisses me off every spring because I can’t do a bear hunt in my home state. Two makes black bears incredibly hard to hunt. Three leads to a “shitpile” of bears. So we end up with a lot of negative interface between humans and bears and keeps bears over carrying capacity in nearly every GMU in the state. Way to go…. 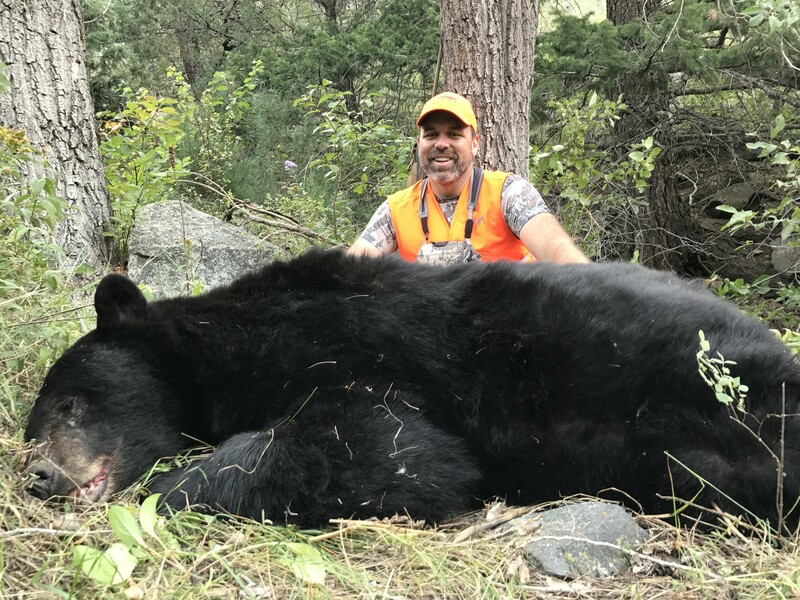 So as I prepared for my Colorado fall spot and stalk bear hunt I chose to focus my efforts on lower county 6.000-8.000 feet where the largest concentrations of bears exist and where I knew I could get large views of places that held a lot of berries. My plan was simple, get to a great glassing location well before daylight and scan large ravines and cuts near water that had berries growing in the shoots coming up out of the creek bottoms. Once I found a bear I would formulate a plan to make my approach and take the shot. As I scouted digitally I lined out 5 different large drainages that I would focus my efforts on and hope to find my bear. These were places where I knew I would have big unimpeded vistas of rolling broken country along each creek. Colorado bear season begins on the first few days of September and this year it was the second which means it’s still summer. Highs in the 80’s and 90’s are most common and most years it stays pretty dry. Because of this, I decided to focus my energy on morning hunts where temps would be in the 50’s. I assumed that a several hundred pound creature wearing a pretty remarkable parka would not be moving all that much in the 80-degree evening temps we were experiencing at that time. I worked in early to my chosen spot that day well before light and got myself set up on a ridge where I could glass 4 different brushy drainages that held berry bushes. The drainage dropped off below me about 500 feet and abruptly rose on the other side nearly 1000. I could see more than a mile to my left and about ¾ of a mile to my right. The sun began to allow me to see I methodically picked apart the side hill across from me looking for a bear to chase. That day, however, all that as in the cards was seeing a few deer and watching pretty wonderful sunrise hit the hills across from me. As the heat and the mirage picked up I gathered my things and made the sweaty hike back to my truck. No bear that day but I assumed this hunt would a marathon not a sprint and honestly I was excited about the time I would get to spend outside behind the binoculars. This day started much like the last I was even in the same drainage just upstream about a mile from where I had been the day before. This walk in was quite a bit longer but there was more of the vegetation I was looking for in this location than where I had been the day before. As dawn broke I went to work with my glass memorizing every inconsistency in nature’s pattern looking for the animal that would bring the intensity of my day up exponentially. I love hunts like this where you basically exist in a state of relaxed focus and at any moment you can get hurled into a frenzy that can tax your mind and body many times to the point of extreme fatigue. This day would be all about relaxed focus and I was grateful to seven deer and two coyotes that gave me something to look at other than greenery that day. On day 3 I was joined by Tyler because the shop is closed on Mondays which gives us a chance to go use all the cool gear we sell. This day I choose a different location altogether. This one would provide a chance of seeing an elk as well which Tyler had a tag for. Our plan was to glass for the first hour and then move up this ridge we were on to check several basins on the back side of this area where elk often bed then make a huge loop back to the trailhead and eventually the truck. This days approach to our glassing point was much further than what I had done in the few days prior. The thought being that if we got something there were two of us for the pack out and we could get a bear or an elk to the truck before the 90-degree heat had its way with it. In the first hour of the day, we spotted a few deer and one smaller 4x4 elk that was about 700 vertical up the ridge we were sitting on in the path we were planning on ascending to make out loop out and back to the trailhead. Without seeing any bears we decided to head up the hill and see if that small bull was a satellite to a larger herd and hopefully a bigger bull. As we hiked up the ridge I remained diligent in peering every place I could down into ravines on both sides of us. About 300 feet up the ridge I saw something dark in the bottom and pulled my binoculars to my eyes and was shocked to find it was a bear! He was about 200 yards below me and completely asleep under a tree in the grass. I have never in my life found a sleeping bear but I guess there is a first time for everything….I quickly stopped Tyler who was ahead of me and began to try to get a shot. As I knelt down to rest my rifle on my pack I would lose the bear in the oak brush. So I stood bad up and tried to find a window. There were no trees to rest on and we didn’t bring along enough tripod for the job. I typically hike with a monopod trekking pole but of course, had forgotten it that day. I move 75 yards to the left, no shot. I move 150 back the other way, no shot. All the while this bear slept below me. Finally, I just decided to sneak down to about 100 yards and shoot him off hand. I crept down the hill inching closer and closer taking my time not to kick anything loose or crunch the dry vegetation at my feet. As I got to 100 yards I stopped and shouldered my rifle. After giving one more look for cubs I put the crosshairs where I wanted them and touched the shot loose. The bullet hit him square and he stood up abruptly I sent another round and this time he backed into cover as is to plan an attack on whatever was assaulting him. Not long after he charged down the drainage and crashed into the bottom. I had my bear. As I walked up on him I really didn’t know what sized bear he was. He just kept getting bigger as I got closer. It was not until I put 6’ 5’’ wingspan from the tip of his tail to his not that I realized he was well over 6’ long. I had shot a beast. I was blown away by the size and scale of him as I sat next to him. He had a jet black coat with no star and sported a huge scar that crossed most of his face. He was awesome! After a celebration, pictures, and the breakdown we loaded him in our Mystery Ranch Metcalf’s and headed for the trailhead. 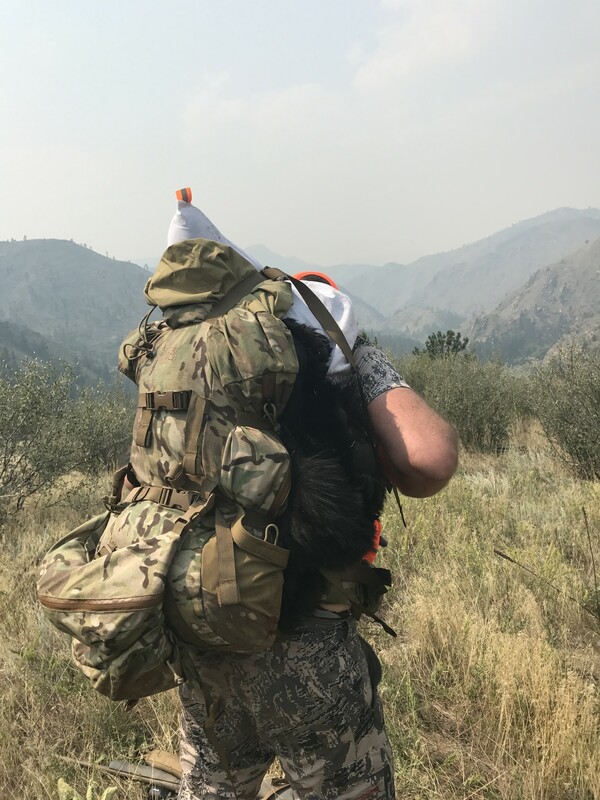 It was a hot pack out….on steep unshaded ground but we made decent time and just basically plugged in for the workout moved it out until we were to the pickup. This hunt had not disappointed and it was fun to have it happen in the fashion it did. It was also great to share this hunt with Tyler and really lucky he was there to help me pack out. When I took the bear to get sealed the biologist figured he was 7 years old and his skull measured 19” for the mountains he is a giant and I could not be more grateful that I got him.